You Don’t Need More Time. You Need A Deadline. 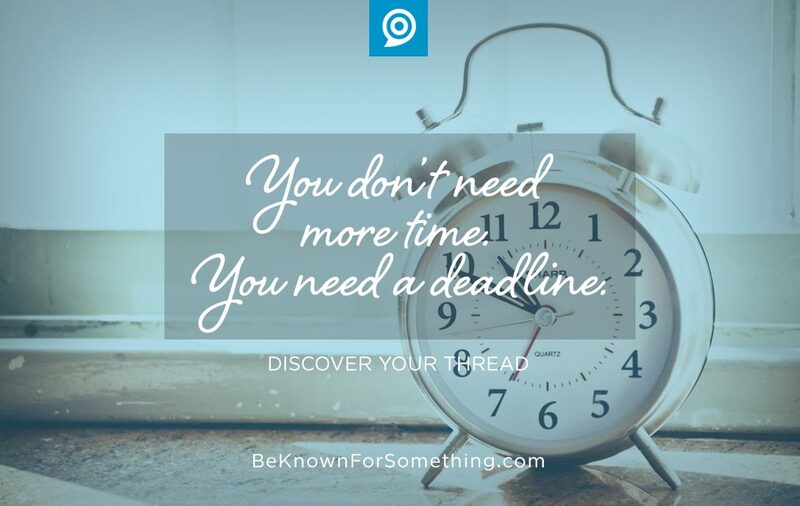 Be Known for Something : Discover Your Church Communication Thread / Business Essentials / You Don’t Need More Time. You Need A Deadline. Time. There never seems to be enough of it. And I should know. I’m a creative and I’ve worked in the agency business for 30 years. No one ever gets enough time. 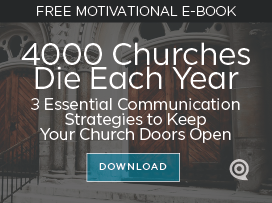 As an underlying foundation, you, as a church communications person, need to give up on trying to gain more time. Instead you need to impose more challenging deadlines for yourself. You don’t need more time. You simply need a life-or-death deadline. Isn’t it amazing that you can be given a deadline and always seem to “just” make it? Our minds somehow know when to crack the whip and get to work so that we barely make the deadline. But often, we get in the habit of being just a little late. Know those people? The ones who always arrive a few minutes after the set time? Their brains have just been set to activate 5 minutes too late. It usually means that the real deadline isn’t being held accountable. Learn to set deadlines and be consistent with accountability. It’s easier than creating false deadlines and keeping up with the deceit. It’ll be tough at first but ultimately praised later. Look at your church calendar. Each event is probably requiring something from your communications department. To juggle everything and do an exceptional job with each requirement, you need to impose deadlines on each ministry. They have to understand. Discuss the requirements. Based on the way you’ve tiered your ministry activities, you need to assess what each ministry is assuming you’ll do for them. They simply want their targeted audience to hear about their event and attend. Deal with expectations and be fair. Consider your limitations. You have limitations of capacity. Your staff (or you) are limited in what you can do based on your overall hours, tools, and talent. Understand that just because a project will take an hour; you can’t do it in the next hour. Meetings eat up a lot of time in Ministry World; can you think of other limitations for your team? Understanding capacity (how much you can accomplish in a day on average) is what will empower you to keep people happy. Miscalculating it will cripple you. Together decide on reasonable deadlines. Based on requirements and capacity, you need to guess at how much time will be required in advance of an event. Top tier events will require the most time so start there. Consider how many weeks in advance that you need to have notice and details. Establish the deadline — perhaps in the beginning let ministry staff know that you’ll honor it this time but you may have to change next time based on success or failure. You want to keep them happy with realistic expectations. That’s your goal! “So what happens if they miss the deadline”? That’s the huge question. Ask them to suggest something first. Then realistically establish the “punishment”. This is tough! But if you don’t hold them accountable; they’ll program themselves to be progressively late. And that’ll ultimately hurt both of you and the ministry. Remember you’re all on the same team.